Great Blue - play beautifull online sloy machine! Great Blue is a 25 payline, 5 reel online slot which is great fun to play and features stacked wilds and scatters which when three or more are hit, the bonus round is triggered. The wild card symbol is depicted by a Killer Whale - Called Great Blue. This is a stacked wild and can appear on any reel and any of the 25 paylines, which are available to play. The scatter symbol is a pink clam, which when appears three or more times on any spin, triggers the Great Blue Bonus Round. Great Blue is a mid to high variance slot game, meaning the payouts can be quite considerable. However the higher the variance, the higher the propensity for your bankroll to be eaten away at quicker. The feature of Great Blue which is triggered by hitting three or more calms in a single spin, is the truly great part about this slot and is one of the reasons it is still regarded as one of our favorite slots available to play online. Once triggered, you are taken to a screen whereby you have to pick two clams out of a selection of five clams to choose from. 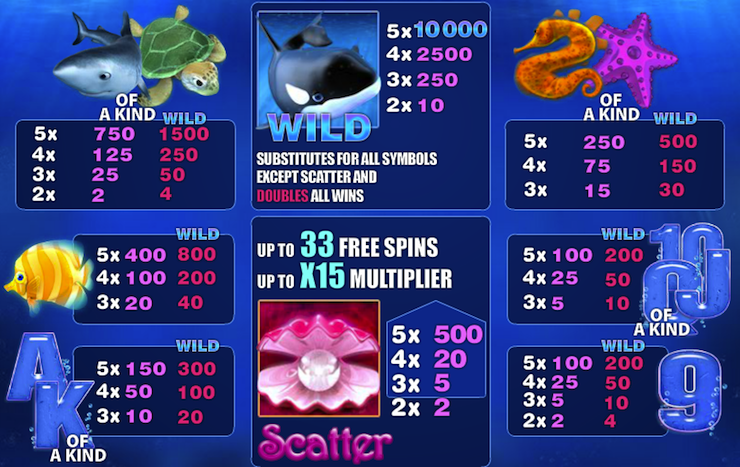 Inside each clam are additional spins and bet multipliers. You can therefore obtain up to 33 free spins and a multiplier of 15. In addition, the Great Blue stacked wild also features in the free spins round, thus making your potential win from the free spins round 100x or more.